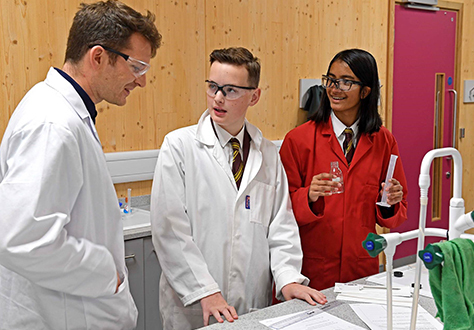 On Thursday 6 December Charterhouse hosted one of five heats of the Royal Society of Chemistry (RSC) Top of the Bench Chemistry competition for the Downland region covering Surrey, West and East Sussex and parts of Greater London. In all, 49 schools competed in this region’s event. In our heat, Charterhouse achieved a winning score of 123 out 140. With all results now in from the region, we have been informed that we have won the regional event and will now represent Downland in the national final. There are 35 local sections in the RSC, covering the UK and Ireland, and each is entitled to send a team to the national final. The final will be held later this year and involve a short test of factual chemical knowledge and a practical chemical problem solving exercise. Our winning team of Bill Zhang, Daniel Cross, Emile Jurgens and Antonio Zhang are looking forward to challenging for the winning prize. Charterhouse last made the final in 2012-13.